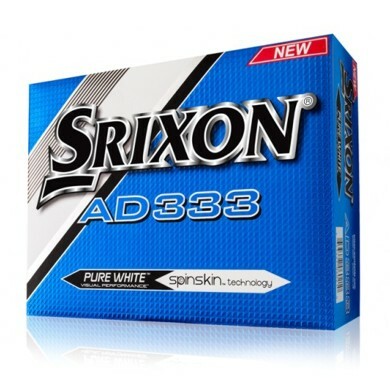 If you have a swing speed of 80mph or higher and are after more distance without sacrificing feel, then the AD333 golf balls from Srixon are for you! This ball enhances distances with the least amount of drag thanks to the Energetic Gradient Growth Core and an evenly sized dimple design. This ball also features SpinSkin Technology which helps produce more spin around the greens for better control. Next generation Speed Dimple technology combines uniformity of dimple design with higher surface coverage, creating more distance and wind resistance. The Aero Power Dimple design delivers a penetrating trajectory with higher lift force, resulting in incredible carry and distance and superior stability. Designed to improve greenside spin without sacrificing distance and tee to green control, the proprietary SpinSkin coating combined with a new urethane cover improves friction between the golf ball and club surface by 20%, resulting in unmatched greenside performance. This is a patented Srixon technology that is utilised in the core of every single Srixon golf ball made. E.G.G. describes the varying stiffness of the Srixon core. This stiffness variation is employed to achieve benefits over a uniform-stiffness core. This soft-to-firm stiffness configuration allows the golf ball to produce high ball speed and low driver spin.